It’s always fascinating to watch the direction a company will move as they expand and pass through the growth process. Facing the countless variables and unknowns that go along with executing an idea, it’s very evident (especially in this industry) that the core values on which a company bases itself will slowly but surely surface and many times end up being the deciding factor between success and failure. Surfboardbuilders.com is no different and appears to be taking custom-built surfboards to the next level and doing so in the right way. Accessibility – Anyone looking for a new board would be hard-pressed to find a retail shop that gives you the same access to as many well respected and highly skilled shapers that you get at SurfboardBuilders. 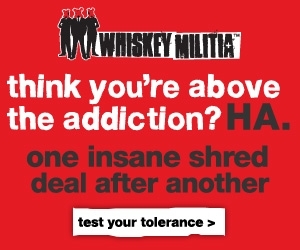 With 18 and counting of the industries’ best (Gary Linden, John Kies, Bill Shrosbree, and Doc Lausch to name a few) as well as a bit of personal history on each, you are now given top of the line options as well as a bit of interesting insight into who it is that’s creating your board. Value – Thinking about the countless boards that have made their way through my own quiver, there have always been a special few that become impossible to part with. Once I know the boards performance ability is where it needs to be there are a wide variety of reasons that go into making a board ’special’ therefore keeping me going back to that particular shaper. With the process used by SurfboardBuilders.com, the boards value is being built well before it even touches the water. As soon as the customer begins to put thought into what he wants from his board and visualizes himself ripping session after session with it while moving through the creation process, the unmade board is already building value in the surfers mind. If the quality and performance levels are where they should be that value will only continue to increase as waves are had and the tendency will be to return to the boards creator time after time when it’s time to make additions to the ‘family’. Simplicity – Being a person that can easily become lost and confused when moving around certain sites, finding the most ‘user-friendly’ site for whatever it is I’m looking to do becomes key. 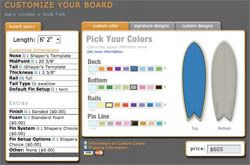 SurfboardBuilders custom board building process is easily started on their home page and the user is taken step-by-step through the process in a simple manner until finished. Even purposely attempting to complicate the ordering process (which for me is pretty easy to do) used on their site went to no avail. SurfboardBuilders has recently added a blog that features insightful interviews and thoughts given by their featured shapers that can end up being pretty useful, if not just interesting to read, when looking for a customized board. As they expand their pool of shapers the accessibility and additions of well-crafted boards similar to those your favorite pro rides will only continue to increase and the possibilities of what your next ride will be on become endless. Posted by Shaun	on Monday, February 4th, 2008	in Surfing.